YZM: What sparked your interest in Sophie Scholl? 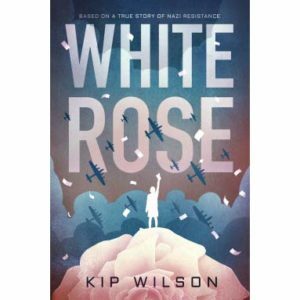 KW: When I first learned about the White Rose in high school German class, I found the group’s mission—standing up against the Nazis in spite of the danger—to be incredibly inspiring. Sophie Scholl became a personal role model for me as the youngest and only female member of the core group. While resistance led by adults like Colonel von Stauffenberg (who organized the plot to kill Hitler) was obviously impressive and could have had a great effect had it succeeded, to me as a teenager, the kind of resistance effort run by people not much older than I was really grabbed my heart. YZM: How do you account for her extraordinary bravery—and empathy—especially given that she was so young? KW: I actually think bravery is common among young adults. Young people are known for their passion, impulsivity, and recklessness—traits that can be seen as negative but were important strengths that propelled Sophie and the others to act as they did. As far as Sophie’s empathy goes, much of the credit for that goes to her parents for raising their children in a household that valued morals, justice, and the power of one’s own conscience above all else, especially at a time when all morals seemed lost. YZM: Can you describe the highs and lows of your research process? KW: Without a doubt, the research highs were the trips I took to both Ulm and Munich, where the events of White Rose play out. As an author of historical fiction, no matter how many books I read about a subject, there is no substitute to actually visiting key sites to get a feel for what it could have been like in a protagonist’s shoes. In these cities, I visited the sites of some of Sophie’s former residences, followed her footsteps from the flat to the university, stood at the balustrade where she stood and threw leaflets into the atrium, and visited her grave. I also got to spend time in the archives viewing her handwritten text and drawings. All of this served to bring me closer to Sophie as a person. I love pretty much all aspects of research, but some of the lows include waiting for ordered sources to arrive and trying to decide which sources to trust when information conflicts across sources. YZM: Were there instances in which you had to surmise what might have happened or invent details that were lacking? KW: Because White Rose is told from a close first-person perspective, I did my best to insert myself in Sophie’s head and imagine her thoughts and feelings about certain events. I used letters, diaries, interviews, and biographies to inform me about what kind of person she was, but that doesn’t mean my re-imaginings of what she was thinking or feeling in given moments can be 100% accurate. For instance, when considering the events of Kristallnacht, I had no written evidence of Sophie’s specific thoughts or actions. But we do know that her father went out to check on their Jewish neighbors, we do know she had Jewish friends in school. And we do know that as a moral person with a conscience, she would have felt horrified at the events and guilt at her own inaction. I let all of these inform my reimagining of her reaction. YZM: Why did you choose verse to tell the story? KW: My inspiration to write in verse stemmed from a love of reading poetry and novels in verse. I wrote my doctoral dissertation on Rainer Maria Rilke’s poetry, and have been devouring mountains of verse novels since the form became more popular. I honestly tried for years to find the right format for the subject of the White Rose, but only during a chat with two verse novelists did I figure out that writing the story in verse might be the very thing it needed. Verse allowed me to get much deeper into Sophie’s head and emotions, which I had found ironically difficult with all the words available in prose. Poetry lends itself really well to emotional, tragic situations, and the whitespace helps balance the heaviness of the words on the page. YZM: What do you hope readers, especially young ones, will take away from this book? KW: Sophie Scholl’s story is an important one to tell because history repeats itself. It’s essential to look back and dig in both to humanity’s failures and triumphs in order to be able to build a better future. As anyone who studies World War II and the Holocaust knows, human beings are capable of terrible things, but we also hold the capability to question, to resist, to stand up for others, especially those from marginalized groups. As anyone who pays attention to the news knows, people today—especially young people—need role models like Sophie Scholl more than ever.